This is because a formative assessment allows the student to better understand the teacher's expectations. Think about this in the context of arguing from evidence. A student presents their argument, which includes evidence, and the teacher acts as an interested skeptic, asking higher order questions around the student’s argument. For example, imagine that a team of students has just carried out an investigation into whether a region in Southern California is experiencing a drought. They’ve analyzed data, and then written a conclusion in which they argue that a difference of five millimeters of water supports the claim that there was a drought in Southern California during May of 2015. If the student cannot explain how the data supports their claim, you get immediate insight into the depth of their understanding because it tells you they don’t really understand why they’re analyzing the data and how it relates back to the phenomenon being explored. However, if the students are able to push their argument further and say, "Actually it's not just the fact that it's five millimeters, but it's five millimeters in the specific location, at the specific time, and this is how we arrived at that particular piece of data. We carried out an investigation in which we compared the rainfall in X number of locations, and then as a result of that comparison, we realized that the range of observations was less than one millimeter, and when you looked at the average that it came to this five millimeters, which was drastically below the average rainfall for the last 30 years in the same vicinity. That's why we believe that this is significant support for our claim that this is a drought." The teacher may listen to that and say, "Okay. I appreciate what you've said, but what I'm really looking for is for you to incorporate what you've said into your written conclusion. You gave me a claim and evidence, but you didn’t make the argument the way that you did verbally to me right now." In that moment, those students learn better what it means to form an evidence-based conclusion as part of that scientific process. 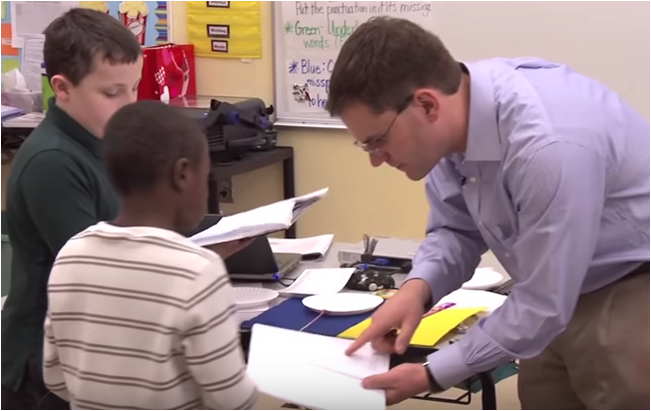 From the teacher’s perspective, they are learning better how students are internalizing their expectations and whether the pedagogical techniques they’re using in the classroom are effective. If they see a pattern of misunderstanding the expectation among several students or student groups, that may signal a need to monitor, redirect, or reconsider their pedagogical approach. One of the unspoken benefits of this type of learning and assessment is that it helps create a culture where risk taking and making mistakes are productive for reaching the ultimate goals of both students and teacher. What we're talking about here is really a culture of thinking because formative assessment, this low-stakes feedback, opens everybody up to making mistakes since the mistakes aren't personal or things that students will be judged on. Students learn that their own ideas can be refined by hearing other people’s ideas and considering feedback, and they realize that identifying a mistake or experiencing an unexpected outcome as a result of a mistake is an opportunity to better understand how to perform well. This culture of thinking and formative assessment helps to highlight for students that thinking differently is not only acceptable but also encouraged, so that it is no longer a source of social anxiety. Students also become better able to separate an individual from the individual’s idea. Finally, both students and teachers become better listeners because the only way to make progress in a formative assessment is to genuinely listen to the other party. Listening is different than waiting your turn to speak. However, making the shift to formative assessments is powerful because they give students evidence of how they are performing over time, which empower them to improve their own learning and to really own the issue. 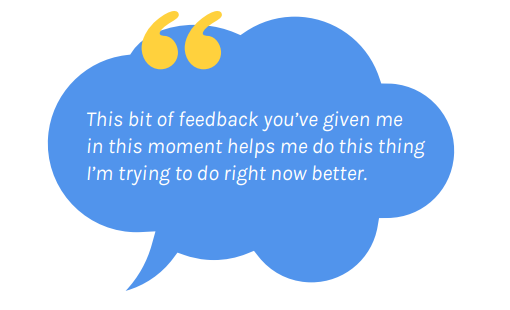 In the same way that students get frequent, focused feedback, teachers also get feedback that is useful for improving their instruction in the moment. If we can create a culture of thinking and risk-taking among teachers pedagogically, we give them the permission to take the risks, to release the responsibility and to have 80% formative feedback and 20% or less of summative. That's where teachers move ahead in their practice, become more effective, and ultimately impact the lives of students on a much deeper level, and impact results. That's what we see here in the actual state level assessment data. These frequent insights into student progress also clue the teacher into where a particular student stands in terms of their level of understanding in all three dimensions at any given moment. The information an educator can glean from these types of interactions helps them navigate their class, shepherding their students individually and as a group through the key ideas and the requirements of the standards, and get them to a point where the students have developed frameworks of skills, content, and critical thinking. This has been done through this formative feedback process. The end result is that these formative assessments empower teachers to improve their own instruction because the insight gained by the teacher in terms of students’ thinking helps them change what they’re going to be doing in the next minute, hour, and class period. This post was updated on 7-17-18.